What is the thinking behind awareness in everyday decision making? Awareness: conscious and mindful of situation or fact. Note: When I speak negatively about awareness, note that it is always in the light of "hyper" awareness or "excessively" aware. Again, operating on the definition of "want to change" is not a bad thing - it means you are comfortable with the way things are. We must decide on a framework for how to view self-awareness so that it is not viewed in a vacuum and so that relations can be drawn to create the idea. That framework here is choice. It comes down to the want to change. Let us take a deeper look at each of these facets. This isn't the most important quadrant and its analysis is mostly useful in comparison to the other quandrants. Now that I consider it holistically it may even be better renamed to "stupid" to put it harshly.. or someone help me with something politically correct. Basically with a high want to change but low self awareness one would end up very confused - knowing they are acting in a not ideal way, but unable to have the clarity to see how their actions play into the greater life. People in this position would often be criminals, as high want to change is indicative of wrongdoing, but low self awareness would make them incapable of understanding how to escape their situation or change their mindset. People in this section would not spend over a few weeks, months, or years in it. With high will to change and a mindset that allows them to see all aspects, the situation would change quickly. There is not much to say here as the double positive's benefits are self-evident. Again, operating on the definition of "want to change" is not a bad thing - it means you are comfortable with the way things are. High Self Awareness however is bad in combination with it though. Without want or ability to change, but being overly conscious of all actions is anxiety. For those suffering from anxiety, perhaps one way to attempt to address it is by realizing these two facts within anxiety. People in this situation are very common. Caged in the circles of thought and unable to escape it but through sleep. Though it might seem not in the best interest of an individual, it is actually very satisfactory. Low Want to Change means you are content with your life as is, which can be a very good thing. Low Self Awareness pairs well with this as you don't need to be hyper critical of every decision or thought you have, which would just lead to anxiety. Key also to this position is the ability to move in a diagonal direction (relative to the graph above). 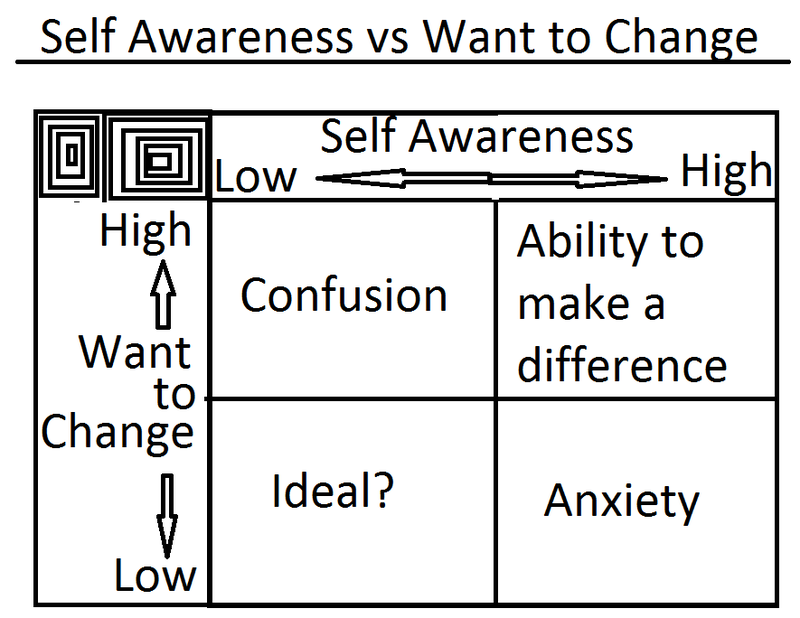 Moving into a position where you do have a Want to Change would mean that you should move into a mindset of raised Self Awareness so that your change is swift, and efficiently executed. People resting in this position are probably the happiest and most satisfied of any classification. Though it may seem like the upper righthand portion would encompass those improving their lives, that is not necessarily true and I would want everyone to take away the benefits of both the upper right portion and lower left portion - especially the lower left as I believe society overlooks peaceful happy people. Looking back maybe I should have placed the "Ideal" tab right on the Y axis in the middle. I didn't mean to imply that zero Self Awareness should be good, as you should always be mindful of your actions. Zero or absolute minimal Self Awareness would mean a zombie-like state which I wouldn't recommend. Just being aware of your position can help you understand your circumstances and where you want your mindset to be in the future.